Ave Maria Bond Fund invests primarily in U.S. Treasury and agency securities and investment-grade bonds of domestic corporations that do not violate core values and teachings of the Roman Catholic Church. The goal is preservation of principal with a reasonable level of income. Performance data quoted represents past performance, which is no guarantee of future results. Investment return and principal value are historical and may fluctuate so that redemption value may be worth more or less than the original cost. Current performance may be lower or higher than what is quoted. Visit www.avemariafunds.com or call toll-free 1-866-AVE-MARIA for the most current month-end performance. 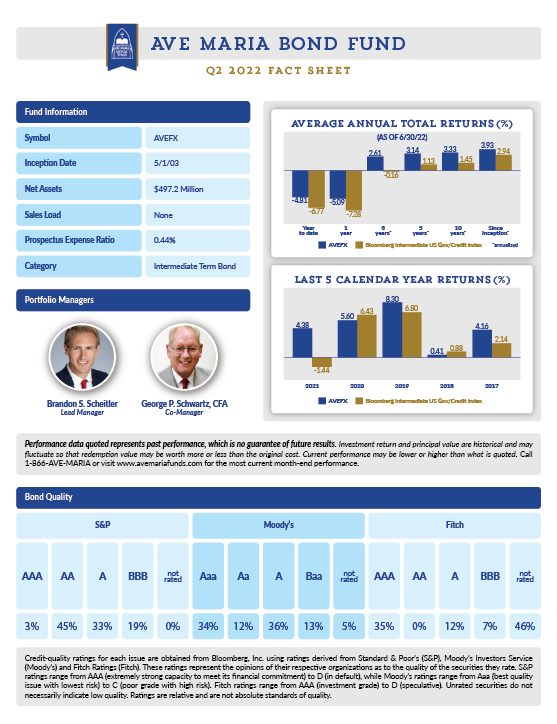 For standard performance information please click on the "Quarterly Fact Sheet" below. Ave Maria Mutual Funds are no-load and have no sales charges or commissions. They are available to investors through various types of investment accounts, including individual, joint, custodial and retirement accounts such as IRAs. Coverdell Education Savings Accounts are also available. Fund services include Automatic Investment Plan (AIP) option and Automatic Withdrawal option. The minimum initial investment for each Fund is $2,500. To invest, please read the prospectus carefully, complete the application, and return your check and application. The Funds are also available through many different financial services firms, who may charge additional fees. Some of the firms that offer our Funds are listed here. If you have a financial professional helping you with your investments, tell them about your interest in Ave Maria Mutual Funds. The Bloomberg Barclays Intermediate U.S. Govt./Credit Index represents securities in the intermediate range of the Bloomberg Barclays Government/Credit Index. The Government/Credit Index includes Treasuries, Government-Related Issues, and USD Corporates and is a subset of the U.S. Aggregate Index. Indexes do not incur fees and it is not possible to invest directly in an index. Schwartz Investment Counsel, Inc., a registered investment adviser established in 1980, serves as investment adviser for Ave Maria Mutual Funds. The Adviser invests in securities only if they meet the Funds’ investment and religious requirements, and as such, the returns may be lower or higher than if the Adviser made decisions based solely on investment considerations. The Funds’ method of security selection may or may not be successful and the Funds may underperform or outperform the stock market as a whole. All mutual funds are subject to market risk, including possible loss of principal. The Funds’ investments in small and mid capitalization companies could experience greater volatility than investments in large capitalization companies. AVEWX invests in foreign securities and securities issued by U.S. entities with substantial foreign operations. Investments in these securities can involve additional risks relating to political, economic or regulatory conditions in foreign countries. These risks include less stringent investor protection and disclosure standards of some foreign markets; fluctuations in foreign currencies; and withholding or other taxes. AVEFX invests primarily in fixed income securities and as a result the Fund is also subject to the followings risks: interest rate risk, credit risk, credit rating risk, prepayment and extension risk and liquidity risk. Request a prospectus, which includes investment objectives, risks, fees, expenses and other information that you should read and consider carefully before investing. The prospectus can be obtained by calling 1-866-283-6274 or it can be viewed and downloaded here. Distributed by Ultimus Fund Distributors, LLC. Please enter the email address with which this account was created. You will receive an email shortly with instructions on how to change your password. Please read all terms and conditions before continuing to login screen. WEB ACCESS IS PROVIDED SOLELY FOR THE PURPOSE OF VIEWING ACCOUNT INFORMATION. This website does not process or facilitate shareholder transactions. Transaction requests and account questions should be directed to Shareholder Services at 1-888-726-9331. Transaction requests made by e-mail to this site or the investment manager may not be received and cannot be processed. Online information is available only for accounts held directly with Ave Maria Mutual Funds. If you hold Ave Maria Mutual Funds through a brokerage account or financial intermediary, your account information should be accessed through that firm. While the information provided from this site is believed to be current and accurate, shareholders are responsible for reviewing account statements and transaction confirmations received by mail. There are no implied or expressed warranties on the information provided from this site. Ave Maria Mutual Funds and its agents do not warrant that the functions contained in this web site will be uninterrupted or error-free. While Account information is provided over a secure connection, Ave Maria Mutual Funds and its agents make no warranty against security faults that may be contained in software or internet browsers. Ave Maria Mutual Funds and its agents are not liable under any circumstances for any direct or consequential damages that may result from the use of, or the inability to use, the information on this site. To continue to the page you are requesting, please click the YES button or click the CANCEL button to remain on Ave Maria Mutual Funds website. You must be logged in as an ADVISOR to access these files.